I decided to take the Independent candidates and establish how many of them are using WordPress as their Content Managment System. So regardless of other online presence – just over 50% of candidates have no website. Taking those 85 candidates that do have a website, I wrote a quick script that searched the home page of their site – and looked for the obvious DNA that one would expect with the most obvious Content Management Systems. Where this was not obviously available – I actually looked at the source and came to my own conclusions. 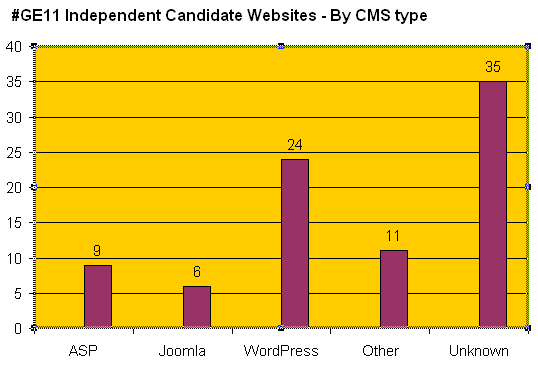 So WordPress implementations (both self-hosted and originating out of wordpress.com) seem to be the most popular branded CMS in use by candidates – with just over 28% of sites. Can you give us your best prediction as to which independent candidates will succeed in each constituency. We are interested in forming a loose alliance with some of these candidates.